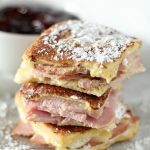 A yummy brunch finger food- these sliders are made Monte Cristo style, featuring thick slices of carving board ham & tangy gruyere cheese, a sifted powder sugar finish, and sweet raspberry preserves for dipping. Start by cutting each dinner roll in half. Spread a generous amount of dijon mustard on the inside of each half. Place the top half back on to make a sandwich. Next beat together your eggs and milk in a small bowl. Dip the bottom half and top half of your slider in the egg mixture. Do not let it soak and get soggy. Spray a heated skillet with non stick spray. Grill your slider just as you would a grilled cheese. Until golden on both sides. If you prefer you can place the slider in a greased baking dish, and bake until golden and cheese is melted. Just skip dipping them in the egg mixture.